Florida Ground Pros offers expert landscaping, irrigation, lawn care, sodding, mulching and landscape lighting services in Lakeland and other cities in Central Florida. At Florida Ground Pros, we deliver comprehensive landscaping and lawn services all under one roof. Regardless of the specific services you choose Florida Ground Pros for, we consistently operate according the same principles of integrity, keeping the client’s long-term interests in mind and creating as much value for the client as possible. Florida Ground Pros started its journey in 2008 when Justin Foley founded Foley’s Lawn Services. With a Ford Ranger truck and red trailer, Justin Foley had a dream to own his own Company. 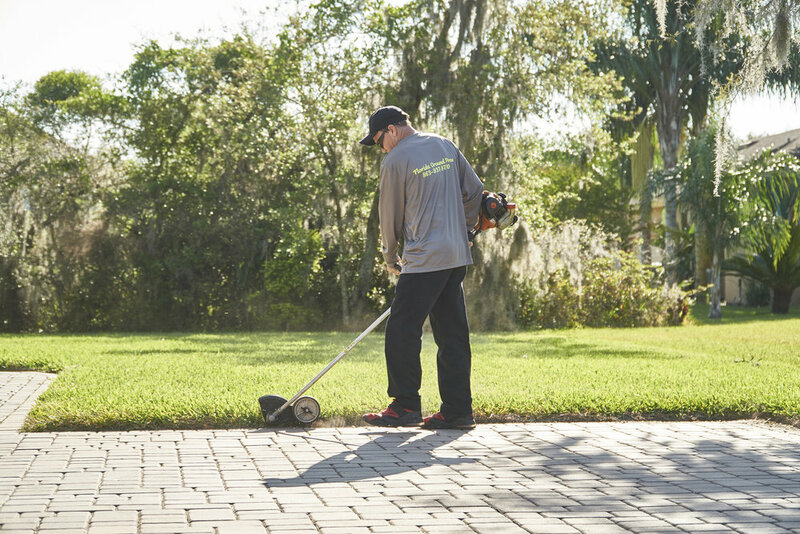 Foley’s Lawn Services provided a multitude of landscape services for both residential and commercial clients in Central Florida. Then, in 2013, the company was rebranded as Florida Ground Pros and given a new mission: to be one of Central Florida’s premier landscaping companies, with services in every aspect of lawn care for our commercial clients in Central Florida. If you’re looking for a trusted local lawn care company who understands the local market and can help you save money on lawn and landscaping maintenance, call us today at 863-777-5901 to get started. Landscaping experts proudly serving Central Florida – Lakeland, Plant City, Winter Haven, Bartow, Auburndale, Haines City, Poinciana, Davenport, Lake Wales. Make your property stand out from the rest! We offer full lawn maintenance services to multi-family, communities, home owner associations, commercial properties and property managers. Our Irrigation department focuses on the perfect system for your site and water distribution. We provide regularly scheduled inspections and provide detailed monthly reports. We offer full landscape installation for your site. From commercial, home owner association, apartments, multi-family and communities. We can make your site be the most envied in your area. Landscape lighting provides both ambiance and safety for your property. We design, install, maintain, repair, and renovate landscape lighting systems for commercial and residential clients. We are extremely familiar with the needs of the Local Residents, Home Builders and Businesses for quality sod and dependable service. No job is too big or to small for Florida Ground Pros, for both commercial and residential projects. We offer a full line of mulching services and products. Mulching is not only the best way to jump-start a great lawn, but can also be used to conserve moisture in the soil, enhance aesthetics of a property, and reduce weed growth. At Florida Ground Pros, our paver installers do it right so you will be able to enjoy a perfect patio, driveway and walkway for a very long time. Your new brick or concrete paver patio, driveway or walkway will look great and be built to last. GET FINANCING ON LANDSCAPE INSTALLATIONS! The rains, high heat and humidity of summer can be the hardest season on both the property and the owner. Not only does outdoor lighting showcase some of your home's most attractive landscape features, but it provides essential illumination . Yard landscaping does not have to be tough or extreme. There are all kinds of things that you will need to find out about prior to you starting your own yard landscaping. Landscape Design – A wonderful yard landscape design idea is to make use of evergreens. Grass landscape design does not call for to be significant or tough. You need to look for a lawn landscape design idea like the one above that will benefit you throughout the year. Deciduous trees will certainly not be lovely in all periods.